Koh Phi Phi Outrigger stands alone on Loh Bagao Beach dominating one of the most beautiful beachheads on the island. Formerly known by the name of the Phi Phi Island Village Resort and Spa it has excellent Pool Villas and Beachfront Cottages as well as deluxe rooms. The pools, diving and spa facilities are excellent. The 4 star Koh Phi Phi Outrigger has all you need of a tropical paradise, a stunning beach, a jungle and cliff backdrop, a coconut plantation and one of the best resorts on Phi Phi Island. On the north and east of the main island it is far from the hubbub of Phi Phi Don Village but close enough to go and explore if you want to take a change of scenery. Koh Phi Phi Outrigger is also close enough to all the beauty spots of Phi Phi Ley. Maya Bay, Viking Cave, Pi Ley, and Loh Samah are only 15 minutes by speedboat and can be enjoyed in a half day tour or longer. The resort is also just 10 minutes’ walk from Lanah Bay, the ultimate get away beach. The Koh Phi Phi Outrigger offers Junior Suite Beach Front, Deluxe, Deluxe Garden, and Superior rooms set out in rows back from the beachfront. The style of accommodation of the Junior Suite Beach Front, Deluxe, Deluxe Garden, is the same but with the Junior Suite having the beachfront and larger internal and external space. The superior rooms are the next level and are comfortable and good value. The Koh Phi Phi Outrigger has the space to have some wonderful facilities. The Wana Spa is a great place to be pampered with massages and treatments. The 2 swimming pools under the coconut canopy are of space to relax, the smaller of the 2 doubles up as confined water for the PADI diving open water program. The dive school is an easy going place to organise some great adventures on 20km of reef. The Phi Phi dive sites offer a great variety from 20 meter wall dives, to underwater boulder scenery, pinnacle diving and the famous Wreck dive, 2 shark points and a host more. The Koh Phi Phi Outrigger has tennis courts for some light afternoon fun with the early cooler morning and evening slots being more popular. The resort has some enchanting restaurants serving traditional Thai, fresh seafood and simple beach snacks that make this an all in one resort. You can reach Koh Phi Phi Outrigger from both Phuket or Krabi. Perhaps the most common route is the Phuket international Airport as there are 3 times as many flight from Bangkok to Phuket as there are from Bangkok to Krabi. The speedboat transfers get you from Phuket to Phi Phi in 45 minutes and has the advantage of getting you directly to the resort reception. If you take the standard Phuket to Phi Phi ferry you arrive at the main pier in Phi Phi Don Village but then need to transfer round the coast to the resort. The main resort deals happen all year round and can be found at Koh Phi Phi Outrigger deals. Depending on the time of year they will include Free Night Specials, Fixed Night Promotions, Special Discounts, Early Bird Offers Honeymoon offers. There is also a long stay discount offered by hotelATM.com and phi-phi.com which gives a free night stay for every booking over 15 nights. Due to the nature of 'high season' and 'low season' weather there is a massive difference between prices from May to October 'low season' and the rest of the 'high season'. Travelling during this lw season but avoiding June and September when the monsoons pass through can offer superb value. Likewise the Deluxe and Garden Deluxe room type are similar rooms but have different prices because of their location. The 5 star Zeavola Phi Phi Resort and the 4 star Holiday Inn Phi Phi Island are the similar resorts just 2km up the coast. 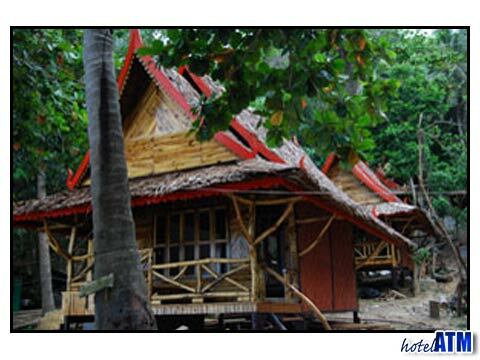 Until November 2012, the Koh Phi Phi Outrigger was formerly known as Phi Phi Island Village Resort and Spa.